Talking in the special features section about the creation of ‘Iron Man’, Stan Lee suggests that making the superhero’s alter ego Tony Stark a weapons manufacturer and arms dealer was a deliberate attempt to challenge his readership. Clearly based on multi-millionaire Howard Hughes, Stark was a complex and flawed character that Lee was trying to make acceptable, if not downright attractive, to an audience that might be alienated by the hero’s profession. Lee’s memory of his creative motivation is not entirely convincing; it is unlikely that in the ‘Cold War’ of 1963 a patriotic arms manufacturer would be seen as a pariah in what was still a heavily youth-oriented medium. Tony Stark’s high-rolling lifestyle of conspicuous consumption coupled with the development of devastating weaponry would be positively attractive to most teenage male readers. It was only with the radicalisation of America’s youth that Stark’s trade, as the ‘merchant of death’, became anathema. Marvel Comics became hugely popular in the late 1960s not least because of Lee’s ability to keep his finger on the pulse of youth culture and his packaging of the stable of comics as ‘pop art productions’. The garish appearance and the convoluted plotting and crossover backstory of the Marvel universe particularly appealed to those enjoying all the diversions of the counterculture; the comics are referenced both in Tom Wolfe’s history of Ken Kesey’s Merry Pranksters, The Electric Kool-Aid Acid Test, and in Michael Herr’s jungle-level panorama of the Vietnam War in Despatches. As a callow ten-year-old who didn’t really concentrate on the television news, my most affecting introduction to political protest was a letter, about Hubert Humphrey and the antiwar riots at the Chicago Convention in 1968, found in the back pages of a Spider-Man comic. In the letters pages of Iron Man readers would often debate about the ethics of the superhero’s involvement in the conflict in South-East Asia. He inevitably became involved as his frequent confrontations with super-villain the Mandarin were complicated by the necessity of thrashing cadres of North Vietnamese ‘gooks’. A battle-weary Iron Man would often hitch lifts home on USAF troop carriers fitfully slumbering under the respectful gaze of US Army ‘grunts’. The ethical debates of the late 1960s were of course brought to a head in the pages of Alan Moore’s Watchmen where, in an alternative history, America had won the war in Vietnam by employing superheroes, the morality of which had so exercised those radicalised readers of Marvel titles back in the late-1960s. This is Marvel’s first self-financed film and there are indications that the studio wants to apply the same joined-up thinking that created the comicbook Marvel universe. A sequel is already planned for a 2010 release, and a post-credits sequence featuring Samuel L. Jackson as Nick Fury, director of SHIELD, refers to the formation of ‘The Avengers’ team of superheroes. Robert Downey Jnr guests in the final bar-room sequence of The Incredible Hulk, approaching General Ross about the formation of a team. A deleted scene from the opening of the Hulk film set in the Arctic supposedly shows a figure trapped in an ice floe, this would be Captain America, who is to have his own feature in 2011 before co-starring with Iron Man and the Hulk in an Avengers movie. Some concern has been expressed that a supposed negative perception of the USA worldwide would colour reactions to a superhero so identified with the American way. Early indications are that the first Captain America picture would be entirely set within the characters origins in World War II, which seems an obvious creative choice as it could climax with the thwarting of Baron Zemo’s plans that lead to the death of the Captain’s sidekick Bucky Barnes, and Captain America’s battle with The Red Skull that ends with his suspended animation in a block of ice. If Marvel could capture the feel of the World War II sequences in Hellboy it should make for an effective opener. Similarly the dynamic of the Captain America story is provided by the character’s status as a hero ‘out of time’ and his loyalty to a vision of America that perhaps does not mesh with the modern world he returns to. Even the Hulk film has paved the way for these later productions, not only with the Iron Man crossover but also with the creation of the Hulk referencing the use of ‘super-soldier’ serums. This creative thread along with the representation of Nick Fury as a creative force behind the formation of the Avengers alludes to The Ultimates series of Marvel Comics where British writers such as Mark Millar and Warren Ellis were given the opportunity to re-imagine the origins of Marvel characters in a modern setting. Tony Stark’s revelation of his secret identity to the press in the film is consistent with this being in the public domain in Millar’s Ultimates. In the film, Iron Man’s origins are updated from Vietnam to contemporary Afghanistan. Visiting US forces to promote his Jericho missile, Tony Stark (Robert Downey Jnr, Zodiac, Tropic Thunder) is kidnapped by local warlords and supplied with ordinance from his own company in order to provide them with a missile of their own. Injured by an exploding mortar bomb in the kidnapping, Stark’s life is saved by another captive, the scientist Dr Yinsen (Shaun Toub, The Kite Runner) who constructs a magnetic device to prevent shrapnel from penetrating the millionaire’s heart. Stark manages to construct a chest plate powered by a unique form of energy to stabilise the shrapnel and then goes on to build himself a suit of armour to affect an escape. Yinsen is killed buying Stark time but manages to deliver a ‘make a difference’ speech. Yinsen’s words make Stark realise the inevitability of the misuse of weaponry. Back home on the west coast, Stark continues to perfect a suit of armour as the ultimate one-man weapon. He uses his flight capability and an array of in-built weaponry to attack his erstwhile captors and destroy their cache of ordinance from Stark Industries. His single-minded obsession with the armoured suit and his negative feelings about the future direction of his company brings him into conflict with Obadiah Stane (Jeff Bridges, Tron, Starman), CEO of the company, and gradually it emerges that Stane has his own agenda. 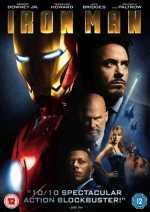 Iron Man the film draws together several strands from the comicbook, the origin of the armour and Tony Stark’s conflict with Obadiah Stane that climaxed in issue #200. At this time Stark was deep into his second capitulation to the bottle and his friend Jim Rhodes had been forced to step into his armoured shoes. After identifying his wearing of armour as a metaphorical and actual shell protecting him from the world of relationships and responsibilities, Stark donned the suit once again to challenge Stane’s usurping of his company. Rhodes himself had problems, which arose from his term in the suit, and while this was explained away as the calibration of the suit to Stark’s brain pattern there was the sense of a subtext, that the wearing of the armour carried with it something of a psychological curse. Having defeated Stane, Stark came to realise that his revolutionary circuitry had found its way into other armoured weapons systems and he set out to render it inoperative, inevitably this brought him into conflict with other armoured individuals including freelancers and state endorsed operatives. Iron Man’s vigilante excursion to Afghanistan in the film to destroy those of his company’s weapons in the hands of the warlords is a version of this operation. Some reviews have suggested that the final conflict with Stane is too abbreviated; it certainly seemed that way in the book. A confrontation building over a season was dismissed in a couple of issues. The problem with the depiction of Iron Man in the movie is that, despite having a great actor in the role of Tony Stark, inevitably the superhero stuff has to involve CGI of an armoured suit. The production team at The Orphanage visual effects studio got around this problem by depicting Stark’s head viewing a HUD (head-up display), inside the helmet, inspired by the shots through the visor of Dave Bowman’s spacesuit helmet in 2001: A Space Odyssey. In actual fact the fight scenes and the other scenes involving the armour in action are about right. There were criticisms of the Hulk vs. Abomination fight that climaxed The Incredible Hulk as being too long, and rumours that this emphasis had resulted in Edward Norton’s distancing himself from the end product; clearly you can’t win. The reviews on the Crypto CFD Trader have been mostly positive. The software was created by the well-known economic expert Lenny Hyde. This system has been able to provide good and stable returns to the users because of the integration artificial intelligence concepts into these trading systems. The main aim of the founders of this platform is to give all the users a fair chance to achieve financial prosperity without much detailed knowledge in the crypto trading techniques. Ang Lee’s Hulk was a terrific reading of the character that owed a lot to the comic. Latterly, The Incredible Hulk was a wonderfully intelligent film that acknowledged the presence of an intelligent lead actor on board. The highpoint of that movie was the depiction of the relationship between Bruce Banner and Betty Ross. Cautious, fumbling, they attempt to rekindle some of their former intimacy. When that intimacy seems imminent, Banner cries off, warning of what will occur if he becomes too excited. In what was an almost painful poignant expression of regret, or else the dirtiest joke out, Betty asks if he cannot at least get a bit excited; hard to imagine the Fantastic Four franchise making the same connection with Reed Richard’s unique abilities. Stark’s relationship with uber-PA ‘Pepper’ Potts (Gwyneth Paltrow, Sky Captain And The World Of Tomorrow) is a dance of, at times awkward, restraint. In the comic book, Pepper gets sick of waiting for Tony and marries his best chum, ‘Happy’ Hogan, a character who is cameoed in the film by director Favreau himself. Criticised in some areas for her performance, Paltrow portrays Potts as precise, efficient, and bound-up; she skirts around Stark’s territory as if she is walking on hot coals, perhaps an effect of the killer heels she is precariously balanced upon. It is an affecting relationship with both characters seemingly aware that to let themselves go could be the greatest thing to ever happen to them, or the worst disaster; so best to do nothing. The extras package with this DVD release is the ultimate for the newcomer or the fanboy completist. On disc one, with the movie, is a selection of extended and deleted scenes, none of which suggest anything other than that the director ran a very tight ship. There is an extended sequence around the attack on US troops in which Stark is captured, and a scene in which Stane exhorts his scientists to match Stark’s efforts in creating the armour, which allows for some grandstanding by Jeff Bridges. In another scene, Stark throws a party in Dubai to cover up his mission back into Afghanistan. The other extra on this disc is a trailer for the animated series Iron Man: Armoured Adventures, which features Stark as a 20-year-old boy genius. On disc two, there is a veritable host of extras: I Am Iron Man is a pretty comprehensive making-of, The Invincible Iron Man is a history of the character through its incarnations in the comic-book, Wired is a look at the three companies involved in the visual effects, The Embassy for the suit, The Orphanage for the HUD, and Industrial Light & Magic for pretty much everything else. There is Robert Downey Jnr’s screen test, which shows how some of the dialogue was developed through improvisation, and The Actor’s Process, where Downey Jnr and Bridges work up a scene together. Also included is the spoof news item from The Onion, breaking the news that the popular 90-second Iron Man trailer was to be developed into a full-length feature. The latest news on the sequel has revealed that Terrence Howard is to be dropped from the role of James Rhodes in favour of Don Cheadle. The studio suggested there was an issue about fees but Howard seemed rather lightweight in a role that should assume more significance as the story of Tony Stark and Iron Man develops.